Share the post "Blood Moon"
As we are approaching the end of September I’m finding the real estate market still brisk in North Iowa. It’s certainly good for the sellers in knowing there are still buyers out there. I just received a price reduction today on a newer 3 bedroom ranch home that I have listed that offers more than meets the eye in a drive-by. There’s plenty of room on the main floor, but the real bonus is the semi-finished basement that’s not had any water since the seller have owned it. I could see finishing the rec room off more fully, adding a 4th bedroom with an egress window to where one would have far more finished square footage for much less than competitive listings offer. If that’s not enough to spur interest, it also has a very large 2 car detached garage. One locational feature I like, is it being so close to Hoover school as well as West Park. If I lived there, I’d be out walking the trails every evening. It’s now priced at $71,500. and I’m expecting it to be sold and closed before hard winter arrives. The home is located at 627 N. Harrison, and as a bonus, it’s not in the flood district. For more information, click on the link below. One of my clients called me today asking why 1403 S. Kentucky hasn’t yet sold. My only answer was, “Most buyers have no clue what real valuation consists of when it comes to comparing apples for apples. Yes, it needs some cosmetic updating, but the bones are good, the lot size is very generous (½ acre), the floor plan is great, and the location couldn’t be better.” I also added, “We’ve had 2 offers on it and I’m confident the 3rd one will be the one that gets it sold.” I’m exceptionally disappointed in how many of the younger buyers perceive value. They think no matter how inferior the location is, as long as it’s HD TV staged, it’s the best to be had. I hate sounding negative but there’ve been some homes sold these past 12 months that’ll likely never bring the prices paid again should they come back on the market in the near future. I really don’t like seeing people upside-down with their homes the moment they walk through the door. It reminds me of how in the new car market where if you buy a new car, as soon as you’ve pulled off the lot the value drops immediately. Home buyers are getting too carried away with their purchases of homes and being perceived as luxuries for them rather than long term investments. I spoke with several out-of-town home builders today who freely told me that unless you’re willing to pay top dollar for materials as well as extended labor, the quality won’t be as good as homes built decades ago. I smiled and said, “Oh yes, how correct you are. Many of the homes built in the 1920’s through the 1950’s were far better built and if maintained over the years, will outlast their newly constructed counterparts.” I was glad to find some men of intelligence to be in agreement. 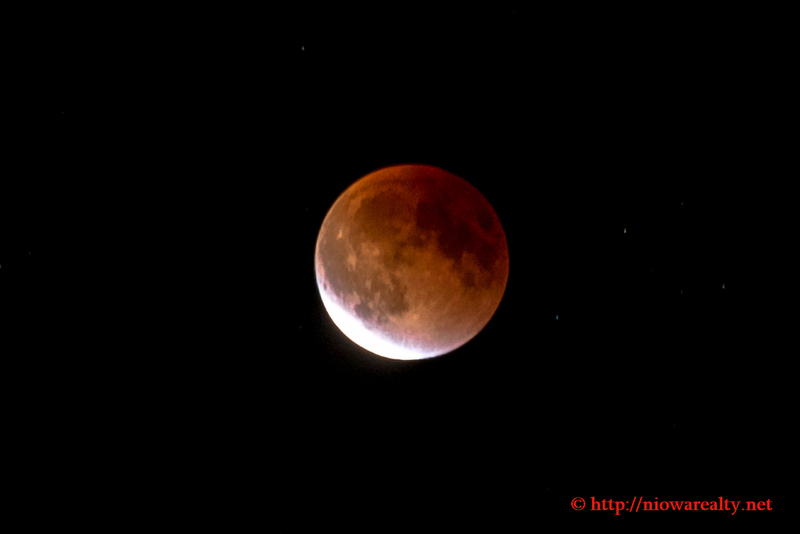 I stayed up a tad bit late last night to take a photo of the Blood Moon. I was quite delighted it turned out as well as it did. I’m even considering having it framed. When seeing it, I was a bit creeped out by the color and likely the reason there are so many superstitions regarding it. I’ll have to do a little extra research on some of the different folklores surrounding it. Irregardless of its meaning, I think the photo above is about as good as it could get while crossing last night’s clear sky over North Iowa.